The Dropout and Truancy Prevention Network (DTPN), a program that provides an innovative solution for aggressively tackling chronic truancy and the dropout crisis, using Wounded Warriors and others with physical challenges as mentors for at-risk students, announced today that it has named General (Ret.) 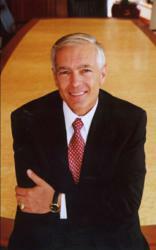 Wesley K. Clark as its Chairman. Truancy is a national epidemic that can be addressed successfully through innovative solutions. Well respected by national, state, and local leaders, General Clark is known for his lifetime of achievement in government service both in and out of uniform. During his thirty-three years of service in the United States Army, he held numerous staff and command positions, served in Vietnam, and rose to the rank of 4-star general and NATO Supreme Allied Commander. Now in the private sector, General Clark is chairman and CEO of Wesley K. Clark & Associates, a strategic advisory and consulting firm, serves on the boards of several private corporations and non-profit organizations and comments regularly on politics, diplomacy and public affairs. The Dropout and Truancy Prevention Network (DTPN) provides innovative and progressive solutions for aggressively tackling chronic truancy and the dropout crisis. By combining location verification technology and the involvement of committed and concerned mentor/coaches, DTPN programs are highly successful at combating truancy, dropout rates and boosting daily enrollments. DTPN's flagship program is called the Right Back on Track Mentoring Program ("RBT"), which operates with human nature and student behavior in mind by providing structure and accountability. DTPN has conducted successful programs in Baltimore, Las Vegas, New Orleans, Chicago, South Carolina, Arizona, and Oklahoma. Web address: http://www.dtpnetwork.com http://www.dtpnetwork.com. You can also follow us on Facebook and Twitter at @DropoutTruancyP. Contact at Wesley K. Clark & Associates is Mary Lee Smith at 501-244-9522 .